I painted this study with flowers at the plain air where I taught senior schoolchildren and students painting. This subject fitted very well into the exercises I had planned as it gave an opportunity to work on expression and to try a new technique. The previous task was to depict a field of shriveled prickly wheat. That subject demanded the according implementation: I suggested painting it “dryly and poignantly”. The color was painted “in wipe”, the ears were painted by abrupt slashes of brush, forming the thin sharp strokes, the coloring was picked up restrained, grey with ochre. The subject with blooming flowers contrasted dramatically with the field of wheat. It was rather a green entangled ball of stems and leaves, with sticking out daises, some of them completely withered and some of them full of life. Somewhere through the thicket orange marigolds showed up. Their petals, so thin, let the sunshine through, glowing as if they were lights by themselves. They stand out from the green background so much that I decided to make one of the marigolds the main character of my picture. This time I set before my students, and surely myself, the task of depicting this dense mess of greenery in contrast with the impression from the shriveled wheat filed. 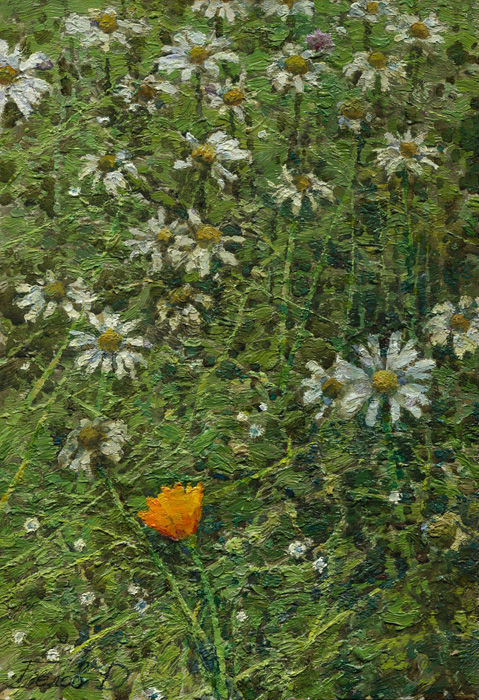 Therefore the next method of painting was chosen: the color was painted densely, creating thick layer of texture, which depicted stems and leaves by itself. It only remained to search for these images and to adjust them a bit, giving completeness. We only painted one marigold with transparent orange paint to convey its “fire”. All times are GMT 0. The time now is 8:51 am.